The time of year has come when many of us will be thinking about how we can improve our lives in 2015. Setting some fitness New Year’s resolutions might be part of that plan if you want to lose weight or improve your fitness level. Anyone can set New Year’s resolutions, and in fact, according to a recent survey, Americans consistently choose weight loss as their priority over every other resolution. If weight loss and fitness are on your list of things to work on in 2015, here are some smart resolutions to help you achieve those goals. 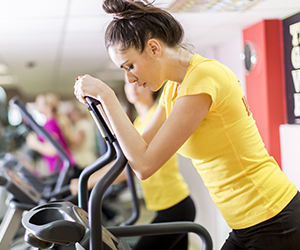 A great first step to getting fit and losing weight this new year is simply to join a gym and start an exercise program. If you don’t already belong to one, you can benefit greatly by having so many fitness professionals available to you in one place. Not only that, but you can bring your kids with you to enjoy kids programs and reduce some of the guilt you might feel over taking time for yourself. If your New Year’s resolution is weight loss, you can get a great head start by simply deciding to cut out sugar. Sugar is a huge barrier to weight loss, and will not only destroy your dreams of a trim waistline, it’s addictive too! Start by making small changes like cutting out refined sugar (white breads, sugary cereal, pastries, desserts) and swapping it for more natural sugar sources such as agave, stevia, maple syrup, and brown rice syrup. You can eventually cut out sweets altogether, but taking the baby steps to get you there will ensure you stick with the plan. If you don’t already lift weights, or participate in some kind of resistance training, get started this year! Cardio is great for your heart, but is only part of the equation for weight loss and overall fitness. Resistance training builds important muscles that help increase metabolism and burn calories while at rest, strengthens ligaments and tendons helping prevent injury, and gives you a leg up on avoiding osteoporosis. Start the new year right with these great new years resolutions that will help you get fit, lose weight, and ring in a happier and healthier 2015!